"Here’s to feeling good all the time!" Why did it all turn out like this for me- I had so much promise. I was personable, I was bright. Oh, maybe not academically speaking, but… I was perceptive. I always know when someone’s uncom­fortable at a party. It became very clear to me sitting out there today, that every decision I’ve ever made in my entire life has been wrong. My life is the opposite of everything I want it to be. Every instinct I have, in every walk of life, be it something to wear, something to eat… it’s all been wrong. 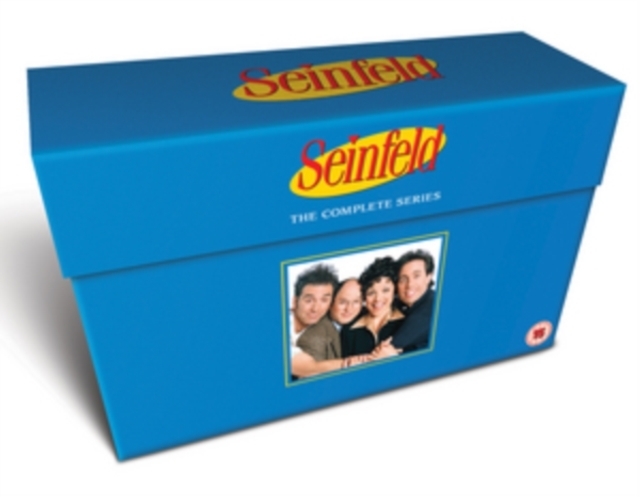 All nine series of the popular US comedy show starring Jerry Seinfeld as an exaggerated version of himself using many of his own life experiences as plotlines. Series 1 episodes are: ‘The Seinfeld Chronicles’, ‘The Stake Out’, ‘The Robbery’, ‘Male Unbonding’ and ‘The Stock Tip’. Series 2 episodes are: ‘The Ex-Girlfriend’, ‘The Pony Remark’, ‘The Jacket’, ‘The Phone Message’, ‘The Apartment’, ‘The Statue’, ‘The Revenge’, ‘The Heart Attack’, ‘The Deal’, ‘The Baby Shower’, ‘The Chinese Restaurant’ and ‘The Busboy’. Series 3 episodes are: ‘The Note’, ‘The Truth’, ‘The Pen’, ‘The Dog’, ‘The Library’, ‘The Parking Garage’, ‘The Café’, ‘The Tape’, ‘The Nose Job’, ‘The Stranded’, ‘The Alternate Side’, ‘The Red Dot’, ‘The Subway’, ‘The Pez Dispenser’, ‘The Suicide’, ‘The Fix-Up’, ‘The Boyfriend’, ‘The New Friend’, ‘The Limo’, ‘The Good Samaritan’, ‘The Letter’, ‘The Parking Space’ and ‘The Keys’. Series 4 episodes are: ‘The Trip (Part 1)’, ‘The Trip (Part 2)’, ‘The Pitch’, ‘The Ticket’, ‘The Wallet’, ‘The Watch’, ‘The Bubble Boy’, ‘The Cheever Letters’, ‘The Opera’, ‘The Virgin’, ‘The Contest’, ‘The Airport’, ‘The Pick’, ‘The Movie’, ‘The Visa’, ‘The Shoes’, ‘The Outing’, ‘The Old Man’, ‘The Implant’, ‘The Junior Mint’, ‘The Smelly Car’, ‘The Handicap Spot’ and ‘The Pilot’. Series 5 episodes are: ‘The Mango’, ‘The Puffy Shirt’, ‘The Glasses’, ‘The Sniffing Accountant’, ‘The Bris’, ‘The Lip Reader’, ‘The Non-Fat Yogurt’, ‘The Barber’, ‘The Masseuse’, ‘The Cigar Store Indian’, ‘The Conversion’, ‘The Stall’, ‘The Dinner Party’, ‘The Marine Biologist’, ‘The Pie’, ‘The Stand-In’, ‘The Wife’, ‘The Raincoats’, ‘The Fire’, ‘The Hamptons’ and ‘The Opposite’. Series 6 episodes are: ‘The Chaperone’, ‘The Big Salad’, ‘The Pledge Drive’, ‘The Chinese Woman’, ‘The Couch’, ‘The Gymnast’, ‘The Soup’, ‘The Mom and Pop Store’, ‘The Secretary’, ‘The Race’, ‘The Switch’, ‘The Label Maker’, ‘The Scofflaw’, ‘The Highlights of 100’, ‘The Beard’, ‘The Kiss Hello’, ‘The Doorman’, ‘The Jimmy’, ‘The Doodle’, ‘The Fusilli Jerry’, ‘The Diplomat's Club’, ‘The Face Painter’ and ‘The Understudy’. Series 7 episodes are: ‘The Engagement’, ‘The Postponement’, ‘The Maestro’, ‘The Wink’, ‘The Hot Tub’, ‘The Soup Nazi’, ‘The Secret Code’, ‘The Pool Guy’, ‘The Sponge’, ‘The Gum’, ‘The Rye’, ‘The Caddy’, ‘The Seven’, ‘The Cadillac’, ‘The Shower Head’, ‘The Doll’, ‘The Friars Club’, ‘The Wig Master’, ‘The Calzone’, ‘The Bottle Deposit’, ‘The Wait Out’ and ‘The Invitations’. Series 8 episodes are: ‘The Foundation’, ‘The Soul Mate’, ‘The Bizarro Jerry’, ‘The Little Kicks’, ‘The Package’, ‘The Fatiques’, ‘The Checks’, ‘The Chicken Roaster’, ‘The Abstinence’, ‘The Andrea Doria’, ‘The Little Jerry’, ‘The Money’, ‘The Comback’, ‘The Van Buren Boys’, ‘The Susie’, ‘The Pothole’, ‘The English Patient’, ‘The Nap’, ‘The Yada Yada’, ‘The Millennium’, ‘The Muffin Tops’ and ‘The Summer of George’. Series 9 episodes are: ‘The Butter Shave’, ‘The Voice’, ‘The Serenity Now’, ‘The Blood’, ‘The Junk Mail’, ‘The Merv Griffin Show’, ‘The Slicer’, ‘The Betrayal’, ‘The Apology’, ‘The Strike’, ‘The Dealership’, ‘The Reverse Peephole’, ‘The Cartoon’, ‘The Strong Box’, ‘The Wizard’, ‘The Burning’, ‘The Bookstore’, ‘The Frogger’, ‘The Maid’, ‘The Puerto Rican Day’, ‘The Chronicle’, ‘The Clip Show’ and ‘The Finale’.